The Short: We're hitting max connections and seeing very poor performance from MySQL during peak business hours and cannot determine if it is a load problem or a configuration problem. We typically have over 200 entries in processlist, almost all of which are "Opening tables", "closing tables", and, slightly less frequent, "cleaning up". The cleaning up entries have COMMAND killed and NULL INFO (SELECT * FROM INFORMATION_SCHEMA.PROCESSLIST). The only queries we really see taking very long are some INSERTS into tables with heavy use, and UPDATE commands with the primary key in the WHERE for tables with heavy us. Their state is “update” in the processlist. We have 800+ databases on our single live server, and many thousands of users using an app that makes frequent server requests with lots of individual record updates or inserts that need to sync to multiple users. 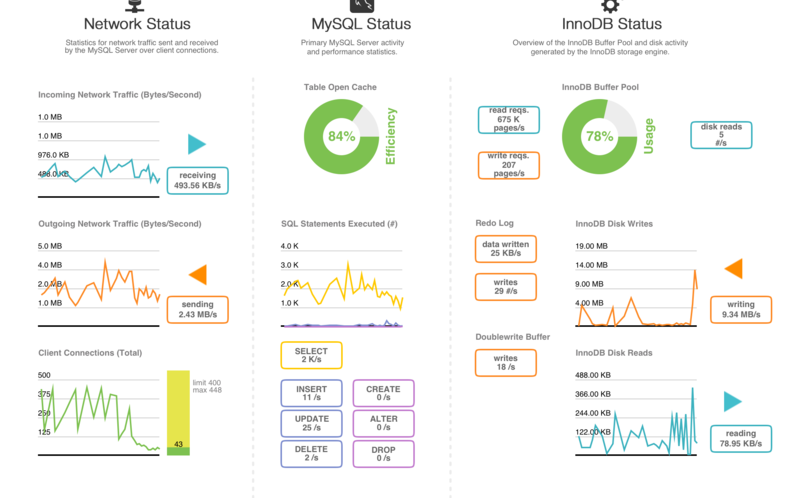 Given the .cnf settings and our server specs, in relation to the MySQL WorkBench dashboard snapshot, should we be experiencing the kind of slowdown/connections we're seeing with this configuration? We constantly hit our Max Connections and get SQLSTATE[HY000]  Resource temporarily unavailable errors in PHP from PDO. Does anyone have any suggestions to improve the performance? Different config settings? We know long term solutions, like putting large clients on separate servers, among others—but for the short term, is there any way to optimize our server? Our app and website are barely usable during the rush hours. My money is on "configuration" – but probably in the opposite way you anticipate... I suspect you've configured it too much. It looks to me as if you've been "tuning" your server's performance right into the ground. If you have been using a "tuning" script – stop doing that. For example... table_definition_cache=6000 and table_open_cache=6000 ... what is the justification for this? Most of the parameters you have configured away from their defaults seem like guesswork. Unless you benchmarked each of these customizations, individually, before and after you made them, individually... well, you probably see where I'm going... they're probably unjustified, and you are likely to be better off without them. Bigger isn't always better. Bigger can be harder to juggle. I would expect good things if you'd simply comment out almost all of these settings except for innodb_* and let the server run with more parameters at their default values. Not the answer you're looking for? Browse other questions tagged mysql php pdo or ask your own question. Why do MySQL queries pile up in “Sending data” state? MySQL connections aborted - should I be worried?